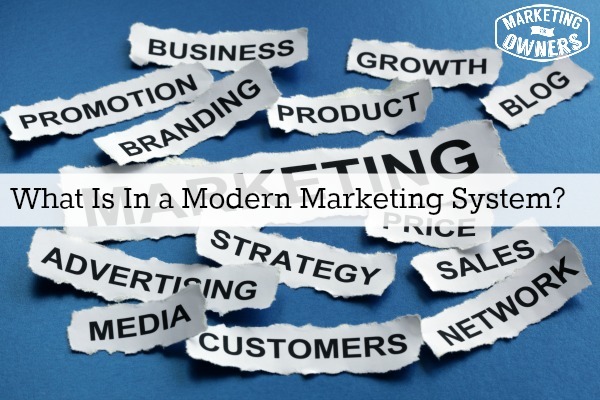 I go on and on all the time about all the things you need for your small business –email list, website, this and that, but let me explain the basics of what is in a modern marketing system. It is just a little process that will help you compare what you’ve got to see if you have a modern marketing system. So, here are the steps you should be taking. You need a presence, so you need a website. You probably have a website, but is that website good enough, is it modern, and does it have a method of getting customers? You may not be as active as some but you need to have profiles that are there. People will look you up, so put something out there every now and again. You don’t have to be super active, just be alive, be present, and have a virtual presence. You need to do some customer profiling and you need to know exactly your typical customer persona or avatar is. You only want to talk to people who are potential customers. With a good quality website, that has a lead magnet, so we have something to offer the potential customer in exchange for their email. So we get them on the website. Then, we have auto responders, we have email processors using a system such as A-Weber that you use to write emails. You send them a welcome email, another email on day one and one on day two, then maybe one on day four, day seven, day ten, day fifteen and you carry on. Don’t forget, you only had to write that email once, for the very first person; once it’s set up on an auto-responder, every single person that opts-in to that permission marketing or that “enter you email and name to get this box”, they will get the same emails at the same intervals. Whether they sign-up at three in the morning, in the middle of the afternoon, while you are having a shower, while you are on holiday, while you are at work, this will happen automatically and it will continue. Don’t you worry, you don’t need training to create these emails. These emails continue and continue and continue and eventually, every now and again, you will make an offer. You will explain what you do; perhaps you are an agency and perhaps you say “Two more spots have opened up, we can now accept new customers. First come, first serve. Please contact”, once you’ve built that trust. So then you get that purchase from them, and now they’ve bought once. Now once they’ve bought, you are going to impress the heck out of them. You will give them that little extra; you will go above and beyond doing things that your competitors will not do. Once they’ve bought something from you, you want them to buy again; you don’t want them to ever consider going anywhere else. You want them to be like Apple’s customers, once they’ve bought that iPhone, then they buy an iPad, then they can change from their PCs to a Mac and then they are Apple forever and they’ll have everything. Before you know it, they’ll have the Apple Watch, and they are buying everything that Apple can throw out. Everyone is waiting for an Apple TV, everyone knows it will be expensive but everyone wants to buy one whether they are going to invent it or make it or not. That’s what you want, and it can be done. You want to ask those customers for referrals. Tell them how to refer, reward them for referring and then make them return it and encourage them and continue to reward them and continue to ask them. And that’s it! So they go off, they refer people; people come to your website. They are your typical customer and they will get your lead magnet, they will give permission, they will get you response, they’ll buy, they’ll start referring, they’ll send their customers who come to your website and now you see: it’s a system. Step one: Take out a piece of paper and a pen. Make columns on a sheet and label them — “Presence”, and write next to it “Website and Social Media”. Next to that I want you to write, in another column, decide whether your website is modern enough and whether, it has a method of lead capture and when was it last updated. Next to the Social Media Icons, I want you to list every social media profile you have, and then list the ones you think you probably should have- LinkedIn, Twitter, Google Plus and write them down as ‘To be done”. Step two: Write down –Potential — customer profile. I want you to then write down and describe your perfect customer. Have you done it, yes or no? 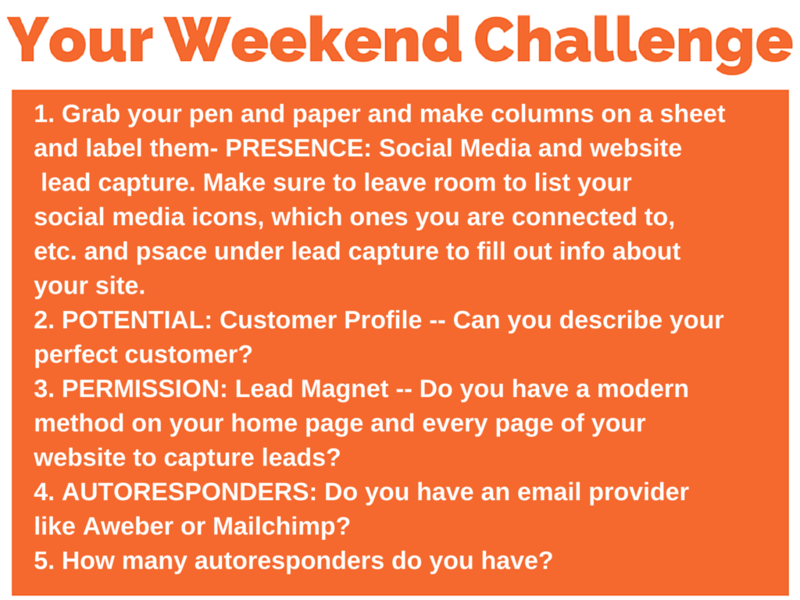 Have you written a one page description of you perfect customer, yes or no? Step three: Permission: Lead Magnet. 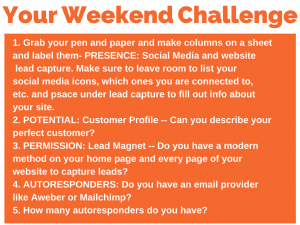 I want you to write down then “do you have a method on the home page and every single page of your website to capture a customer’s email address as a minimum in exchange for something; a course, an eBook, something a lead magnet, Yes or no? Number four: Auto-Responders, do you have an auto-responder email service like A-Weber, Mail Chimp, Infusion Soft, or one of those. Yes or No? Then next: How many auto-responders do you have set up and how long does that sequence run for? Be honest, have you got any? If it’s no, easy answer! If its yes, how many; three, twenty eight, fifty two, more? How long does it run for? And that’s all I want you to do because once you’ve got that, then you can send them onto being purchases and so on and then on to referral. Your weekend challenge is to look at the bits that say no and then to decide what you are going to do about it. If you’re really really stuck, send me an email at info@marketingforowners.com. Just send me a message and tell me where you’re stuck and I’ll try and point you in the right direction. I bet you thought I was going to sell you something. What does your auto responders look like?